The group is listed on the JSE and A2X, with share code SBK, and the Namibian Stock Exchange, share code SNB. Standard Bank Group’s headline earnings for the year ended 31 December 2018 were R27.9 billion (USD2.1 billion) and at 31 December 2018 total assets were R2.1 trillion (USD148 billion). 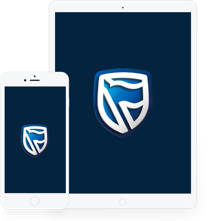 Standard Bank employed over 53 000 people (including Liberty) across all geographies and has 1 200 branches and 9 321 ATMs on the African continent.